Easter eggs are, in our view, a lovely way for developers to make little nods to other games, franchises, or any other subject that might otherwise pass a player by. We've discovered one such reference to the divisive Donkey Kong Country TV show in the Switch version of Donkey Kong Country: Tropical Freeze. As you can see in the video above, very occasionally when you leave Funky's Fly 'n Buy whilst playing as Funky Kong, Tawks will instruct Funky to "Give 'em the old banana slamma, dude!". 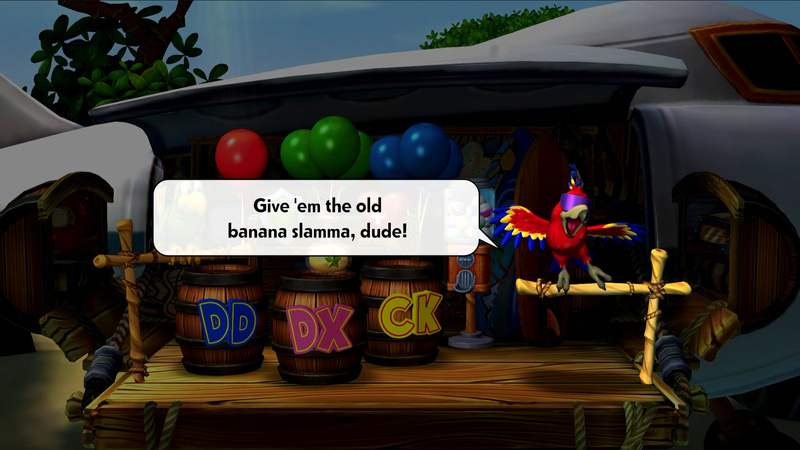 The phrase 'banana slamma' was DK's catchphrase in the short-lived TV series. It's great to see the developers reaching back into the Kong's history, even if this particular aspect hasn't aged particularly well. That show was painful to watch even as a 7 year old. The only thing worse and more painful than that TV show is stapling your hand to velcro. Telling someone you're going to "give em the old banana slamma" seems like a good way to get arrested. Oh, Nintendo and your funny references. Imagine if next time you'll be playing new Zelda game, and Link will suddenly turn to the camera, saying: "Well excuuuuse me i won't go there"
This reference and playable Funky are the best new additions to the game. Zelda: "Well excuuuuuuUUuuUUUUuuuuse me, hero!". Ah so that's why it's $60. @WaddleKing Aren’t they basically the only additions to the game? At least it wasn't a reference to coconut cream pies. Also wasn't one of DK's alt colours in Smash Bros a reference to a yeti from this show? This game was already so good. They're just perfecting an already near-perfect game. I love the new idle animation where he pulls out a Nintendo Switch, and Funky Kong completes the package, finally offering moderate difficulty for those who lack the skill level to enjoy the game. I've had a hard time getting people into this game who aren't that skilled at platformers. Funky is now my ally in converting believers. Oh, the video uploads for time trials runs should be back up and running too. The Wii U version toasted any video that wasn't top 10 globally. I lost so many excellent, world class runs (#12, #50, several in the #100-300 range, etc). 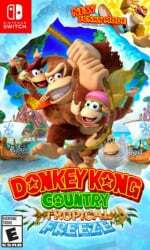 I'm doing a full playthrough as DK to unlock all the levels for time trials, then I'm doing a full Funky playthrough, just for fun. Then it's on to the time trials... with Funky Kong. Can you imagine the insane time trial runs you could do with him? They probably won't let you upload those to the servers because it wouldn't be fair. But it would be awesome if they had a separate leaderboard for Funky time trial runs. The cartoon's renders of the Kremlins and K.Rool were spot on. The Kongs? Uh.... not so much. Could have been worse, they could have put an unlockable episode of the show in the game.....and kill the DK franchise after. lol. The hostility towards the DK cartoon series makes no sense. It is like fertile silt in which YTP grows into a forest. @justin233 I mean, you are not wrong. @wiggleronacid I had it as well and honestly loved it as a kid. It's plenty cringey to me now, but some parts are still legitimately very funny. Although the part where they flash back to a scene that doesn't happen until later in the movie, that... that was pretty bad. @JaxonH Your enthusiasm for this game is infectious. I already own it on Wii U, but I don't really want to play it on that system, you know? Split joycons in docked/tabletop mode are so much more comfortable than using the pro controller, and I'm tempted by the full portability. Might nab it on Switch. I don't know yet. So, um, whats Funky Kong's abbreviation? Ya, it's just so much nicer having a game on Switch. You don't have to fire up a legacy console (assuming you even still have it hooked up, which I would actually recommend for playing GameCube and Wii, but that's another conversation), you get an HD handheld version, you can play with a variety of controller options (I like split Joycon also, it's a natural setup for those who gravitate toward gyro like we do), you can play co-op with someone else anywhere in tabletop mode, and those are just the native benefits. There's also the increased docked resolution, new character, new video upload server, instant screenshots and video capture, etc. If anything, you could always sell your Wii U copy and put it toward the Switch version, then pick it up at BestBuy with GCU for $47.99. Might only be $15 you get, more like $12 after fees on eBay, but that still takes price down to $36, which is nearly half price. $36 to upgrade to 1080p, get a handheld version and a bunch of other benefits. Even if you don't take it that seriously, I think you would really enjoy the time trial runs. They have bronze and silver and gold times you can beat. That's how I actually got into it. I just thought I'd try getting a gold time on all the levels, and I realized it was so fun and addictive and I was getting so incredibly good at the game, that I ultimately started taking it more seriously. But even if you don't just trying to get a gold on every stage is a lot of fun and you'll get all a lot of playtime from it. HEY YO, COME ON, LOOK OUT THE DOOR! That video is hilarious (as usual)! If I remember correctly the DK animated series was on the same low quality level as the Mario, Zelda, and Captain N cartoons. That means cheesy and cringy (and with questionable art). That was the old Nintendo. Since then they got the Pokémon and Kirby cartoons right, and even the Animal Crossing movie was neat. As for Donkey Kong Country: Tropical Freeze, I have completed all of it, except for the time trial medals. I speedrun the old DKC trilogy but i'm not into it in the new ones. @Ardisan It should be 'FK' not 'FU' or you'll know what happens if someone puts a Cranky Kong Barrel right next to it. This nice easter egg isn't justified for me to double dip for this game. Now had it came with DK Returns too, I would get this DAY ONE! Ah well. I can still play it on my Wii U and still have a blast playing it. Yea. I like the old CG cartoon. If they ever make Candy Kong playable I hope they use the cartoon incarnation. I DUNNO, I THINK DIS SONG GOT MEME QUALITY TO IT! @Kutal I can see that being if Zelda becomes a playable character and a Fairy says that to her, in a cutscene or something. It's not an "easter egg" if it's just a regularly occurring part of the game. That's called a "reference". Also the DK animated series was complete garbage. It made the Saturday Supercade DK series look like high art in comparison. @Sikboy1029 That's right Eddie the mean old yeti. And hey no shame in liking the cartoon. It's like the old Mario cartoon, objectively it's not that great but it is at least entertaining. How fitting, since the animated show is to the original games pretty much what the Returns games are to the original games. I'm disappointed that Talks isn't the nameless purple Squawks from DKC3. That would've been brilliant. The first and foremost thing I remember from that animated series is that "Big Bog Monster is Comin' After You" song. "heyyyyyy yo....donkey kong, lets go lets go!" I thought to myself, What could it be? The Big Bog Monster is comin' after you! His terrifyin' face will make ya scream until you're blue! I just preordered the game, was trying my best not to since I played it on Wii U but I couldn't control myself lol. I guess third time's the charm. They gotta get on the ball, releasing the same game three times is unacceptable.